When you enter you will be required to register, upon doing so, you will receive an email, please click the Activate link to confirm your account. You will then be able to complete your entry or nomination. All entries to the awards are free of charge and you can submit a nomination or entry into more than one category. Return at any point using your login credentials to manage your account and modify your entry until the closing date. 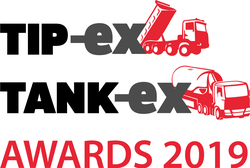 Entries into the Show Innovation Award at the Tip-ex Tank-ex Awards are still open. All other categories closed 29 March 2019. The award is open to Tip-Ex and Tank-Ex exhibitors only showing a product or service at the event for the first time. Results of tests and/or field trials should be included where relevant. To enter the award just let us know your company name and stand number by entering here. Are you the best operator of tippers in the country? If so, then prove it by entering the Tip-ex Tank-ex Tipper Operator of the Year 2019. Entrants for this award have up to 300 words (plus supporting evidence) to prove what keeps them ahead of the competition. Is it a clear and successful business strategy with sound financial management? A team ethos in delivering exceptional customer service? An innovative way of solving problems? You tell us! Entry into the Tipper Operator of the Year Award is free and it is open to any company, be it own-account or hire and reward, as long as you run tippers on the fleet. Are you the best tanker operator in the UK? If so, then prove it by entering the Tip-ex Tank-ex Tanker Operator of the Year 2019. Entrants in this category have up to 300 words (plus supporting evidence) to prove what keeps them ahead of the competition. Is it a clear and successful business strategy with sound financial management? A team ethos in delivering exceptional customer service? An innovative way of solving problems? You tell us! Entry into the Tanker Operator of the Year Award is free and it is open to any company, be it own-account or hire and reward, as long as you run tankers on the fleet. In order to win Tipper Livery of the year at the Tip-ex Tank-ex Awards 2019 our judges will want to see a modern, stylish livery that gets across its message clearly and effectively. Tell us what you wanted to achieve with the livery and how you came up with the design. We’ll also be looking for any benefits as a result of its introduction on the fleet. Don’t forget to attach a high-resolution picture with your 300 word entry. This Award is for tipper and tanker operators, either hire and reward or own-account. An exceptional commitment to all round operational safety in the business. A specific initiative designed to improve safety in a particular area of the operation. In order to demonstrate that all-round commitment tell us what kind of analysis or reviews you carry out to improve safety, and what the outcome has been. In order to demonstrate that specifically designed initiative, tell us how you identified the issue and what you did to resolve it. Entry into the Tipper Safety Award is free and it is open to any company, be it own-account or hire and reward, as long as you run tippers on the fleet. Entry into the Tanker Safety Award is free and it is open to any company, be it own-account or hire and reward, as long as you run tankers on the fleet.